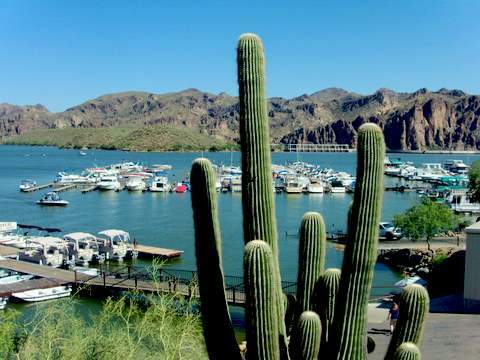 Saguaro Lake, you just won’t believe the beauty of the desert just a short drive north of Mesa Arizona. The scenic curvy drive up the rolling hills is half the fun. Just a few minutes driving and you are in a Saguaro Forest that is framed by craggy desert mountains. For the best view, go there late in the day so the shadows will reveal the moon-like terrain. And you might get lucky and see some spectacular cloud formations. Get there by driving up Power Rd (turns into N Bush Hwy) or Ellsworth (turns into N Usery Pass Rd) which both run next to the site of Salt River Tubing. Yes, the same place where you pick up a tube and hitch a ride down the Salt River. Click here for pictures and movies of Salt River Tubing. From there it’s a short 6 miles or so to the cutoff to the Saguaro Lake. Saguaro Lake AZ is the lowest part of a series of dams and lakes that release into the Salt River. So the next time you float down the river you can see where the water came from! Just before the turn off to the lake you go by the Stewart Mountain Dam Road. This road also gives you access to an interesting ranch at the base of the dam. It has rustic cabins situated next to the Salt River with a view of the jagged cliffs . They also have seasonal fun things to do like horseback riding in the cooler months, and kayaking and tubing in the summer. 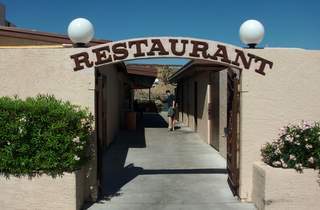 If you prefer a hotel closer to civilization take a look at the Mesa hotels page with maps, reviews, and links here: Mesa Hotels. As you turn into the Saguaro Lake Road notice that you will come up to a split in the road. On the left is the day use and fee area. Go right to get to the Lakeshore Restaurant and the Desert Belle Paddleboat where the parking is free. You can sit inside with air conditioned comfort with huge picture windows. Or you can get an even better view by sitting in the patio with ceiling fans and water misters for your comfort. The food is typical for a place that is located in a national forest; you can get your basic burgers, sandwiches, etc. Then on Wednesday and Friday nights you can get an all-you-can-eat fish fry. The food is really incidental to the atmosphere. The views are worth the drive. And a nice place to sit and take in the best views of the desert lake and mountains. I didn’t see any cheap items on the menu for kids, like hot dogs for example. But you can split something good to eat if the appetite is small sized. The food is a good deal when you remember that you didn’t pay for parking. 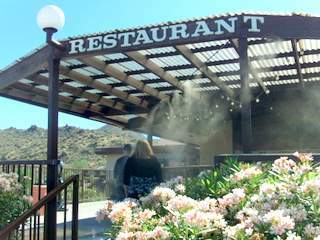 Also realize that you are now dining in comfort in the Tonto National Forest so people and food have to be brought in. Here’s a tip. If you sit inside, the hidden bonus is you don’t get the bugs. Remember this is in a national forest? Well if you sit outside and there is no breeze, some thirsty insects might want to pay your food a visit or get a drink from your glass. Then again if you sit outside, you truly get an amazing view of the lake and the mountains. Sit and muse about the great time you had on the boat or tube or whatever. The restaurant makes you as comfortable as possible by placing water misters to keep the air cool along with breezy ceiling fans. This marina has slips for lots of boats as you can see. Boats are the only way you can get to some hidden sites and camping. 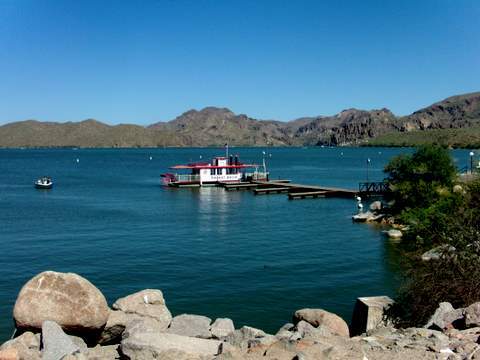 You need a boat to see places like Bagley Flats, and other colorful sounding places like Hidden cove, Skunks Wash, Mesquite Flats and Elephant Rock.